The key global gas price markers appear to be decoupled and following divergent courses. The ongoing fall-out from the Fukushima nuclear disaster has forced Asian LNG prices to record levels, whilst a relatively sedate low price and low volatility environment has continued in the US. In recent months European gas market dynamics have been heavily influenced by the increasing threat of recession. Yet global influences remain and key developments are likely to strengthen the relationship between European, Asian and US gas prices. In August last year we set out some of the key dynamics driving European gas market pricing. While these drivers remain, there have been some interesting developments across both European and global gas markets which we explore in this article. The key global gas price markers appear to be decoupled and following divergent courses. The ongoing fall-out from the Fukushima nuclear disaster has forced Asian LNG prices to record levels, whilst a relatively sedate low price and low volatility environment has continued in the US given robust domestic production. European gas market dynamics are more complex. In recent months they have been heavily influenced by the increasing threat of recession and relatively mild weather. Yet global influences remain and key developments within the global economy and gas fundamentals are likely to strengthen the relationship between European, Asian and US gas prices. Asian LNG prices continued their climb through-out the second half of 2011 on the back of record demand as shown in Chart 1. This was driven primarily by Japan as it continued to buy LNG for gas fired generation to replace its stricken nuclear fleet. Japan has also faced tough competition for LNG with robust demand from other Asian markets, particularly South Korea. However prices have shown signs of softening in recent weeks due to a mild winter and receding concerns as to the ongoing impact of the Japanese nuclear crisis as utilities appear to have high levels of contract cover and inventory. Recent reports suggest current prices to be at just above 15 $/mmBTu down from almost 18 $/mmBTu just seven weeks ago. Asian LNG prices have historically shown a very strong relationship to crude oil which forms the primary indexation term in many long term contracts. Since the Japanese earthquake the relationship has started to break down as prices have been driven up by the unprecedented demand and competition for cargoes. This raises the question as to whether linkage to crude will return once demand begins to drop off and new supply comes online. It also suggests there could be an opportunity for an Asian LNG marker to emerge. At the other extreme, US gas spot and forward prices continued to soften and exhibit very low volatility. The Henry Hub spot price ended 2011 below 3 $/mmBTU, less than one fifth of Asian spot prices. The US shale gas revolution has created, for all intents and purposes, a physically disconnected market with ample domestic supply. There is little prospect of these market conditions changing in the medium term until any plans to export domestically produced LNG from North America are realised. Although several export projects have been granted consents, significant volumes are unlikely before 2015. Questions remain as to whether US policy makers will be willing to accept the increases in domestic gas prices and volatility that are likely to arise as a consequence of exporting significant volumes of LNG. We will explore the prospects and possible implications of North America LNG exports in an article in the coming weeks. 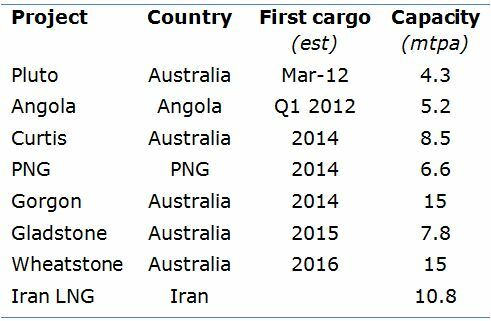 Several LNG export projects currently under construction will come online over the next two to three years (as shown in the table below). Australia is set to become one of the globe’s largest LNG exporters which will significantly reduce the geopolitical risk of global LNG supplies, although there is still considerable uncertainty around the timing of some large projects. At the other end of the geo-political risk spectrum it is unclear when Iran’s LNG export facility (currently under construction) will be commissioned given the sanctions imposed by the internationally community over its nuclear program. The degree to which these new projects ease the tightness in the global LNG market will be driven by the strength of demand growth from emerging markets (especially China and India) and the extent to which demand holds up in developed markets facing an economic slowdown. The level of price convergence across the global markets will be largely driven by this dynamic. Three factors have conspired to force European hub prices sharply lower in the last quarter of 2011: reduced year on year demand amplified by a mild winter, easing concerns as to Europe’s ability to attract LNG cargoes and the threat of Europe re-entering recession. In the run-up to the current winter, NBP forward prices were trading at a significant premium to spot as the market priced in the potential influence of Asian LNG pricing. As the start of each delivery month approached, the premium was eroded as the market became more confident of supply (with Europe continuing to attract cargoes and the weather remaining mild). This process was repeated for the first three months of winter until the perceived threat of any supply disruption evaporated. This has resulted in the premium for the remaining winter months easing to the point where Q1 is barely trading above Summer ‘12. Oil price terms in the long term contracts are specified in EUR and as a consequence the depreciation of the EUR against the USD acts to raise the effective contract prices. We have explored the impact that exchange rates have on European energy markets in a previous post. As a result of the discount of spot to contract prices, energy companies will aim to minimise contract lift and purchase gas from the spot markets. There are several implications of this behaviour. Firstly, it is likely to provide a boost to hub liquidity. Secondly, there is likely to be significant take or pay flexibility available which will strengthen the role contract prices play as a cap to hub prices over the coming months. Finally, it brings into focus the ongoing contract renegotiations between producers and European utilities and the wider debate on gas versus oil indexation. Gazprom has recently indicated that it may be willing to make marginal concessions on levels of gas indexation and has offered several key counterparties price discounts on ‘out of the money’ contracts. Gazprom’s main upstream competitor, Statoil has already given ground and increased the level of spot indexation with its counterparties. However many contract disputes between producers and key suppliers remain unresolved as suppliers push for a more enduring solution to the problems caused by oil-indexation. 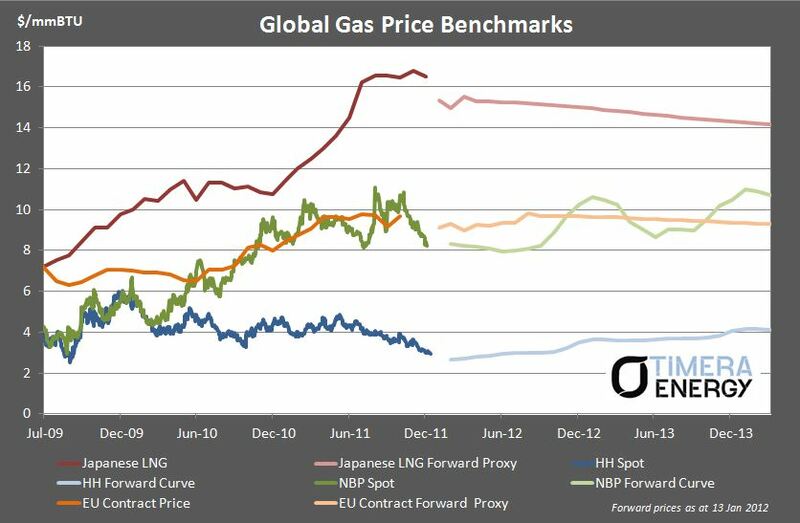 The divergence between spot and contract prices is acting as a more effective catalyst than any regulatory measures for the evolution of European gas hub pricing and liquidity.